For Introduction to Literature courses and Freshman Composition courses that emphasize writing about literature. When Edgar Roberts taught literature and composition he dedicated a substantial amount of his class time explaining to students how they should prepare their writing assignments. The more time he spent describing the assignment, the better the final essays. However, these explicit essay-writing directions were taking up too much of his classroom time. At that point, Professor Roberts started to write and hand out directions, thus saving him valuable classroom time. Over the years, he tried and tested each assignment in his own classes. In addition to writing coverage, Professor Roberts recognized that literature classrooms needed both writing about literature instruction and an anthology to meet the needs of the literature and composition course. Literature: An Introduction to Reading and Writing, Tenth Edition is founded on the principles of writing about literature. It is not an afterthought and it is not treated as a separate chapter or appendix; it is the carefully integrated philosophy of Professor Roberts’ approach to teaching literature and composition. Complete coverage of writing about each element and a total of 32 student essays with accompanying commentary ensure student comprehension of writing about literature and therefore, produce better student papers. 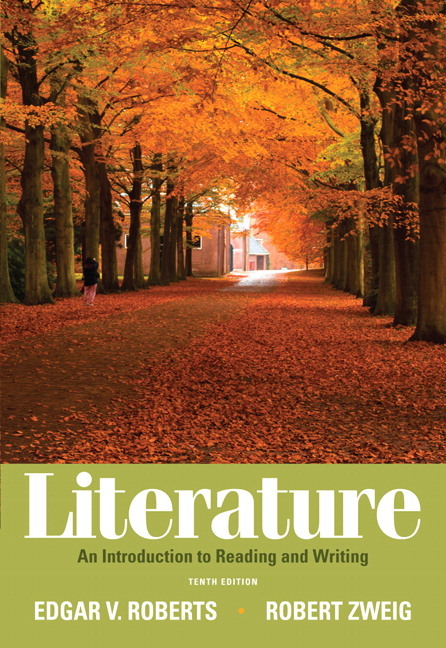 Writing about literature integrated in every chapter—Includes coverage of writing about each element (i.e. character, setting, tone) followed by a sample student essay and commentary on the essay. Helps students progress in their writing skills by showing a response to the work, raising questions about the work, showing how to organize their thoughts, select details, and plan the essay. Prepares students to read critically, walks students through the writing process (discovering ideas, making initial drafts, and completing the essay), and demonstrates the process with 2 drafts of a student essay. Students can easily find writing and reading material. 32 sample student essays–all formatted in the most up-to-date version of MLA-style. Helps model student writing and MLA style for students. Special Writing Topics about Literature—Places special emphasis on different popular writing assignments (compare/contrast, respond, argue) and critical approaches to literature. Coaches students through some of the more difficult aspects of writing about literature. Three chapters on research—one each for fiction, poetry and drama—feature full MLA-style research papers annotated to point out research information specific to each genre. Chapter 10A features full coverage of the research process including paraphrasing material, avoiding plagiarism, and citing sources. MLA document maps: These visual representations help students locate key information on frequently-cited sources such as books and websites. Visualizing genres —Fiction, poetry and drama each feature a section devoted to images that represent key literary principles or visual-based media within the genre. Attractive and Accessible Design–The entire book has been redesigned to make key features and selections easier to find and read. Color insert–This insert features works of art and connects them to various pieces of literature throughout the book. These images help reinforce the themes found in the literature. Graphic novels. This edition features an expanded selection from Maus. Screenshots illustrate the research process in Chapter 10A - showing, not just telling, students how to conduct research in today's electronic environment. Inside front cover—Makes it easy to find the book’s writing and research features. Helpful quick-reference materials—A thorough Glossary of Terms, an alternate Thematic Table of Contents, and both Chronological and Alphabetical Lists of Authors are included in the text. Provides students with easy-access reference guides. Gives instructors flexibility in selecting their curriculum. Table of Contents Design-The table of contents has icons to help you quickly find some of the features. A leaf emblem highlights new readings and a paper icon shows where the demonstrative student essays are found. Instructor’s Manual-This comprehensive instructor’s manual prepares you to teach any of the works contained in the text and also helps you make assignments and compare individual works with other works. Each of the chapters in the manual begins with introductory remarks and interpretive comments about the works (stories, poems, plays) within the chapter of the book. These are followed by detailed suggestions for discussing every study question. Also provides detailed discussion of works contained in the book, reviews of videotape and DVD performances of a number of stories in the book, and references to audio clips of poetry. Writing Assignments and Workshops with sample guidelines for student editors help students to write about literature effectively. MyLiteratureLab (www.myliteraturelab.com) MyLiteratureLab is a Web-based, state-of-the-art, interactive learning system designed to enhance introductory literature courses. It adds a whole new dimension to the study of literature with Longman Lectures which are evocative, richly illustrated audio readings which include advice on how to read, interpret, and write about literary works from our own roster of Longman authors. This powerful program also features Diagnostic Tests, Interactive Readings with clickable prompts, student sample papers, Literature Timelines, Avoiding Plagiarism research aid, Grade Tracker, and Exchange, an electronic instructor/peer feedback tool. Discounted Penguins for literature-- The most popular Penguin Novels used in colleges and universities are now available at a significant discount for value package opportunities! Pick your Penguin at www.pearsonhighered.com/penguin. NEW - Writing Topics. New Writing topic prompts have been added throughout the anthology. This edition our Writing Topics sections are divided into four categories - Paragraph-length Assignments, Essay-length Assignments, Library Assignments, and Creative Writing Assignments - helping instructors see at a glance the suggested assignments available to them. NEW - Part 1 now centers around Alice Walker's "Everyday Use." After extensive deliberation and consultation with users of our previous editions, we have found a more relatable selection for today's students to work as the focus of this indispensible chapter. Maupassant's "The Necklace" continues to be anthologized in the text, now included in Chapter 3. NEW - Attention to the paragraph length assignment. Recognizing that much of the writing students do in their literature course does not take the form of formal essays, we have added new instructions, models, and prompts for paragraph-level responses. NEW Chapter 29: Three Types of Writing about Literature. New coverage of response and literary argument now augments our strong coverage of the comparison-contrast essay in a new chapter dedicated to these three common assignments. NEW Student Papers. The anthology now features 32 student essays (all in MLA format), six of which are new to this edition. NEW heavily revised coverage of Writing a Research Essay. We have brought our coverage of the research process up-to-date with new coverage of the research process, including finding sources in library e-catalogs, in databases, on the internet, and with the MLA bibliography - all illustrated with helpful screen shots. New detailed coverage of evaluating sources has been added and the coverage of note-taking has been adapted to guide students through both pen and pencil and computer-based processes. UPDATED MLA coverage. Our Appendix 2: MLA Recommendations for Documenting Sources - and all other citation examples throughout the text - have been updated for the latest 2009 MLA guidelines. NEW MLA document maps New document maps have been added for Articles found through a Database and for Online Books. A widely praised new addition to our ninth edition, these visual representations help students locate key information on frequently-cited sources. NEW Fiction Selections. Twelve new works, including Sherman Alexie, “This is What It Means To Say Phoenix, Arizona,” Jhumpa Lahiri, “The Interpreter of Maladies,” Chinua Achebe, “Marriage is a Private Affair,” Z.Z. Packer, “Brownies,” Tobias Wolff, “Powder” and many more. NEW Poetry Selections. Over twenty-five new works by poets such as Octavio Paz, Martin Espada, Garrett Hongo, Kay Ryan, Cathy Song, Anna Akhmatova, Louise Erdrich, and many, many more. NEW Drama Selections. Two drama selections - Jane Martin, Beauty and Luis Valdez, Los Vendidos - offer instructors a wider variety of short plays that can be covered in a single class period. NEW Support for MyLiteratureLab: A MLL icon next to the selection and author names throughout the anthology alert you when a resource is available. ***** NEW SECTIONS ARE INDICATED WITH "(NEW)" AT THE END OF THE LINE. What Is Literature, and Why Do We Study It? Mrs. Johnson, with her daughter Maggie, is visited by her citified daughter Dee, whose return home is accompanied by surprises. A condemned man dreams of escape, freedom, and family. Through an evil act, a man learns goodness. Even seemingly ordinary people hide deep and bizarre mysteries. During the Vietnam War, American soldiers carry not only their weighty equipment but many memories. During World War I in Italy, the loss of a loved one outweighs all rationalizations for the conflict. Two old acquaintances friends embark on a journey to recover the body of one of their fathers. Bill and Arlene Miller are looking after the apartment of the Stones, their neighbors, whose life seems to be brighter and fuller than theirs. What would it be like if the prize at a community-sponsored lottery were not the cash that people ordinarily hope to win? Life develops from the repetition and recirculation of dreams and fantasies. There is more to becoming a writer than simply sitting down at a table and beginning to write. Young men discover more than a way to kill time at this local hangout. A husband and wife receive a blind visitor who affects the man’s way of seeing things. In a small farmhouse kitchen, the wives of men investigating a murder discover significant evidence that forces them to make an urgent decision. Miss Brill goes to the park for a pleasant afternoon, but she does not find what she was expecting. To go to a ball, Mathilde Loisel borrows a necklace from a rich friend, but her rhapsodic evening has unforeseen consequences. Jing-Mei leads her own kind of life despite the wishes and hopes of her mother. A faithful follower describes an English general who was knighted for military brilliance. An introspective boy learns much about himself when he tries to keep a promise. A man revisits his childhood home. A young woman confronts the realities of life in the lower classes in turn of the century Japan. Can a mother in a Nazi concentration camp save her starving and crying baby? An intelligent black student, filled with hopes and dreams, is treated with monstrous indignity. Wrongfully detained, a man has revenge as a meal to celebrate his escape. A tour guide learns about a troubled American family on a visit to ruins. JOYCE CAROL OATES Where Are You Going, Where Have You Been? A teenage girl is visited by an aggressive stranger who does not accept “no” for an answer. Phoenix Jackson, a devoted grandmother, walks a worn path on a mission of great love. A Native American student leaves college in California to spend Christmas in his hometown in Wisconsin. Louise Mallard is shocked and grieved by news that her husband has been killed, but she is about to have an even greater shock. A young country boy grows in awareness, conscience, and individuality despite his hostile father. While waiting for a train, a man and woman reluctantly discuss an urgent situation. After winter snows have melted in a small Canadian community, young people start making discoveries about themselves. Jackie as a young man tells about his first childhood experience with confession. A new employee is introduced to the rather unusual and surprising situations in the office. As a checkout clerk at the A & P near the local beaches, Sammy learns about the consequences of a difficult choice. Illustrative Student Essay: Frank O’Connor’s Control of Tone and Style in “First Confession"
What do people think about things that they can’t have? In ancient times, how could a superior woman maintain power and integrity? In colonial Salem, Goodman Brown has a bewildering encounter that changes his outlook on life. Public interest wanes even in a unique person. Is there any limit to what a person can do to make divine forgiveness impossible? How do simple villagers respond to a miraculous visitor who appears in their town? As the end nears, Granny Weatherall has her memories and is surrounded by her loving adult children. As a housewife on a small ranch, Elisa Allen experiences changes to her sense of self-worth. A devoted brother describes how his brother, Sonny, is hurt by racial prejudice, and how Sonny finds fulfillment through love of music. When a group of children visits a toy store for the wealthy, some of them draw conclusions about society and themselves. Bored with life, Dmitri Gurov meets Anna Sergeyevna and discovers previously unknown emotions and extremely new problems. Dr. Jack Fergusson and Mabel Pervin find, in each other’s love, a new reason for being. Is American liberty restricted to people of only one group, or is it for everyone? A man and his young bride deal with the groom's father's disapproval. During World War II, in Nazi-occupied Greece, a young German soldier learns the importance of personal obligations. A man who has witnessed a gang attack on a defenseless woman experiences deep anguish and self-reproach. Involved in a traffic accident, a young man tries to entice his victim into a date. Who is the woman who is trying to emerge from behind the yellow wallpaper? A troop of young African American girl scouts take issue with a white troop at their summer camp. A young widow learns what it takes to save her newly found love. A young man and his father brave snowy roads hoping to meet an important deadline. ANONYMOUS Western Wind, When Wilt Thou Blow? WILLIAM SHAKESPEARE Sonnet 18: Shall I Compare Thee to a Summer’s Day? Edgar V. Roberts, Emeritus Professor of English at Lehman College of The City University of New York, is a native of Minnesota. He graduated from the Minneapolis public schools in 1946, and received his Doctorate from the University of Minnesota in 1960. He taught English at Minnesota, the University of Maryland Overseas Division, Wayne State University, Hunter College, and Lehman College. From 1979 to 1988, He was Chair of the English Department of Lehman College. He served in the U.S. Army in 1946 and 1947, seeing duty in Arkansas, the Philippine Islands, and Colorado. He published articles about the plays of Henry Fielding, the subject of his Ph.D. dissertation. In 1968 he published a scholarly edition of John Gay's The Beggar's Opera (1728), and in 1969 he published a similar edition of Fielding's The Grub-Street Opera (1731), both with the University of Nebraska Press. He first published Writing About Literature (then named Writing Themes About Literature) in 1964, with Prentice Hall. Since then, this book has undergone eleven separate revisions, for a total of twelve editions. In 1986, with Henry E. Jacobs of the University of Alabama, he published the first edition of Literature: An Introduction to Reading and Writing. After Professor Jacobs's untimely death in the summer of 1986, Professor Roberts continued working on changes and revisions to keep this text up to date. The Ninth Edition was published early in 2009, with Pearson Longman. The Fourth Compact Edition of Literature: An Introduction to Reading and Writing was published in 2008. Professor Roberts is an enthusiastic devoté of symphonic music and choral singing, having sung in local church choirs for forty years. Recently he has sung (bass) with the New Choral Society of Scarsdale, New York (where he lives), singing in classic works by Handel, Beethoven, Bruckner, Bach, Orff, Britten, Brahms, and others. He is a fan of both the New York Mets and the New York Yankees. When the two teams play in inter-league games, he is uneasy because he dislikes seeing either team lose. He also likes both the Giants and the Jets. He has been an avid jogger ever since the early 1960s, and he enjoys watching national and international track meets. Professor Roberts encourages queries, comments, and suggestions from students who have been using any of the various books. Use the following email address: edgar.roberts@verizon.net. He has a doctorate in English Literature from the City University of New York, a Masters from Queens College in creative writing and a bachelor’s degree from Queens College in English literature. Dr. Zweig has numerous peer-reviewed publications in journals, encyclopedias and books. In addition, he is currently writing two textbooks for McGraw-Hill on the writing process, due out in 2011, another textbook, Grammar in the Modern World (Pearson) due out in 2011 and is co-author of Literature: An Introduction to Reading and Writing, a bestselling introduction to literature textbook by Longman Publishers. His translations of the Italian poet and Nobel Laureate Eugentio Montale appear in this text. Also, Dr. Zweig has lectured extensively throughout the United States and Italy on Victorian Literature, Poetics and contemporary culture. Some of the American universities he has addressed include Notre Dame, New York University, University of California, Harvard, University of Illinois, University of Delaware, Rutgers University and the Graduate Center of the City University of New York. He has received several scholarships and awards, including a Mellon Fellowship and the Phi Beta Kappa award for “Outstanding Teaching Skills” as one of the Top Ten Professors at Manhattan Community College.